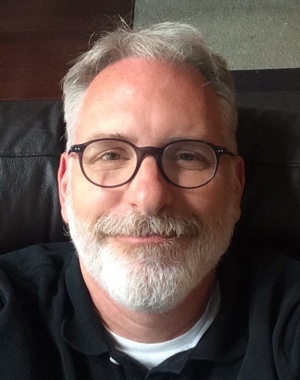 Continuing the ongoing series of interviews with creative artists working on various aspects of movie and TV productions, it is my pleasure to welcome David Crank. In recent years David worked as art director and production designer on productions such as “The Master”, “Inherent Vice”, “The New World”, “There Will Be Blood”, “John Adams”, “Water for Elephants”, “The Tree of Life”, “To the Wonder”, “Lincoln” and his most recent “Concussion”. In this interview he talks about the art and craft of production design and how it evolved over the last couple of decades. 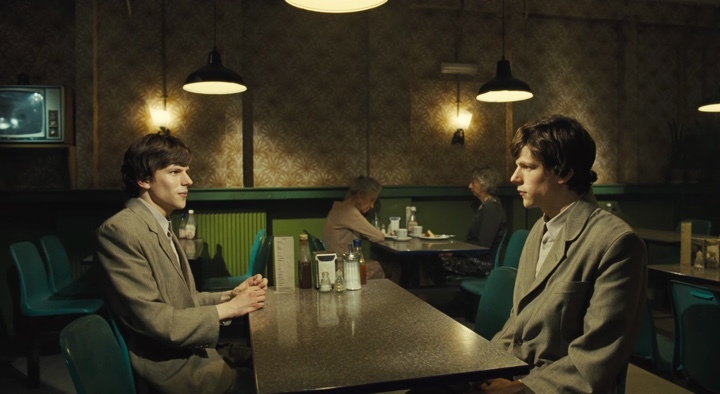 The second part of the interview is about David’s work on the remarkably crafted sets of “The Double” – a dark satirical comedy whose visuals grip you from the very first frame and don’t let go long after the movie has ended. David: I worked for about ten years designing sets and costumes in theater, and then switched over to film around 1990. Film was what I always wanted to do, but I didn’t have that opportunity in Richmond where I grew up. I enjoy both disciplines, but I like being able to concentrate on one project intensely and then go on to the next one, whereas in theater you needed to have two or three going on at the same time in order to make a living. Kirill: If you consider storytelling in these two mediums, theater and film, are there any big differences, or is it sufficiently similar? David: There are different techniques you use, but to me, the storytelling aspect of it is fairly similar. If it happens to be on stage, you can do it one way, and if it’s on film, you can do it in another way. But your ultimate goal is still telling an interesting story in an exciting fashion, and hopefully, engage people. In terms of design, there are small technical differences, but really, design is design. You still apply the same knowledge and skills to both mediums. Kirill: To me it feels like you have the fixed space on stage, and you can’t take the viewers closer or farther away in the same way that a film camera can. David: True, you still do the same things. 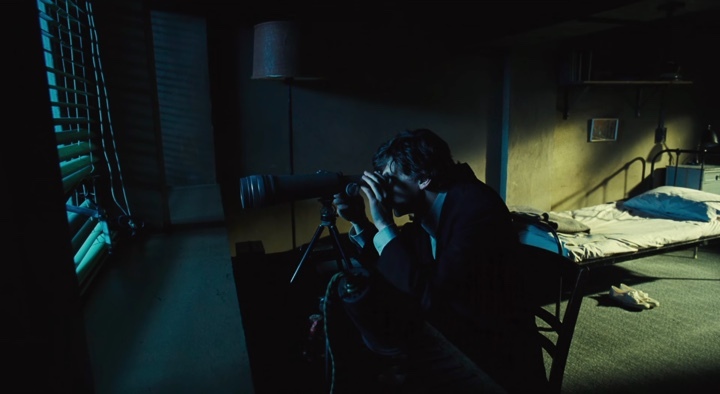 In film you do close-ups and shift the focus with the camera, but in theatre, you can also control the focus on stage by directing the eyes of the audience through design and lighting. It’s a different scale and done in a different way, but, in effect, you’re still doing the same thing. Kirill: Do you find that some stories lend themselves to be better told on stage vs film, or does it depend on the talent of the storytellers to take advantage of the stronger sides of the specific medium? David: There probably are some that do lend themselves to being better told on stage. I think, however, it’s similar to the question of what is better – a book or a movie? In a sense, you should be telling the same story, but taking a different path to get there. The method of each will be slightly different, and while you get certain things from a book that you wouldn’t get from a film, you also get certain things from a film that you wouldn’t get from a book. For me, with film, the main thing that you have to always be aware of is using a cinematic language vs. a stage language. How can you tell something in a movie in a way that you can’t tell it in a play? That’s what you focus on. That’s how you tell your story. Layout sketches for John Rolfe farmhouse set on “The New World”. Courtesy of David Crank. On the sets of “The New World”. Courtesy of David Crank. Kirill: As you said, you started working on films in the early ’90s. That was before digital tools were as powerful and prevalent as they are today. David: I started my career working mostly on historical dramas, because that’s what came to film in Virginia. Initially there was very little CGI used on projects that I was on, except to change the occasional background. The sets were built fairly complete. Kirill: But even on historical dramas it gets pretty expensive to build very big sets. David: Yes it can! When we did with “John Adams”, we had a massive number of sets to construct, many that were too large to build completely. We designed what we wanted them to be, and then sat down with VFX people and talked about what made sense to build in reality and what made sense to build digitally. You split up the work that way. It would be lovely to build it all, but nobody has the money for that [laughs]. You just attack each set separately and see what makes sense. Sometimes you might build a bit more, because if you can do whole scenes without having to augment them with CGI, it might ultimately be cheaper for you. But, you might have a single shot that wants to pull back from there and show more building above, or more buildings beyond, and, that’s when it makes sense to add CGI. It’s different in every single case. There is no formula. You look at the specific problem, and you discuss how to best solve it. 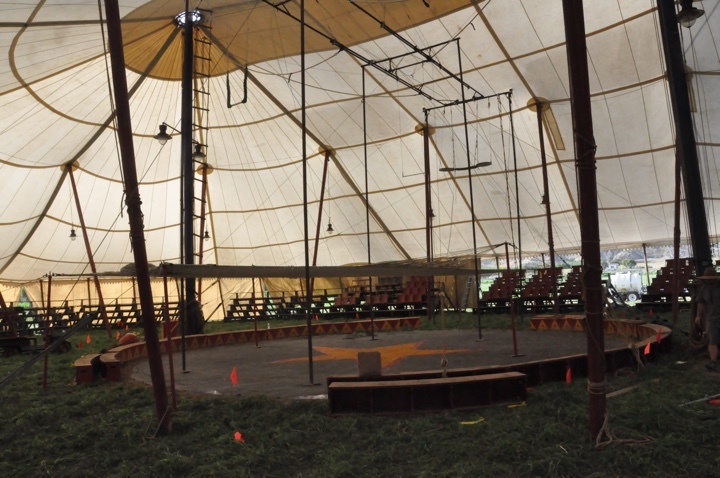 Big top circus tent set on “Water for Elephants”. Courtesy of David Crank. Kirill: Is it important for you to surround the cast and crew with real physical environments? Perhaps the younger generation of actors is more used to seeing green screens around them? David: That is probably right, but I think people always like to have as much real around them as possible. But if you’re doing something like “Avatar”, I guess they just have to figure it out! I would think it’s quite difficult. They’re acting against nothing, basically. They are out there all alone. I’ve not done a film where it was a total green screen environment. I’ve done productions with lots of green screen, but, I fortunately have been able to build a lot of scenery. Most VFX people tell me when we’re starting “Give us as much real as you possibly can. It’s always useful.” And from a very selfish point, there is always a bit of the “wow” factor when people walk on to your set, and it is complete. They get quite excited to be in real environment. 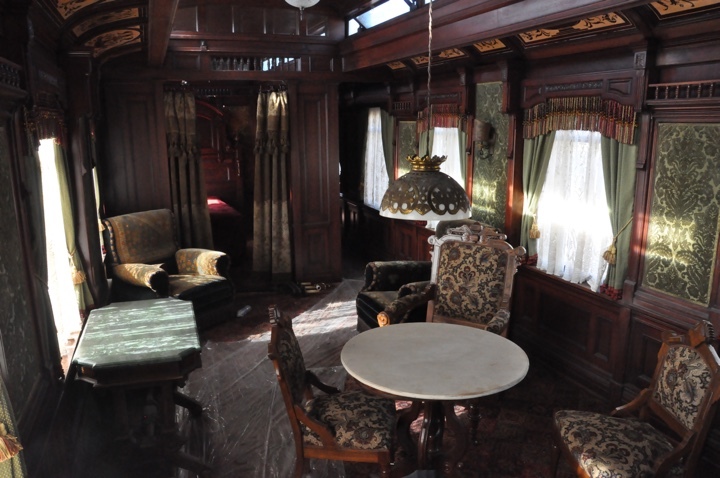 Interior of a train car set on “Water for Elephants”. Courtesy of David Crank. Kirill: Looking at films that you did as art director – “Lincoln”, “There Will Be Blood” and “Water for Elephants” – were those sets that you’ve built, or shot on location? David: They were a combination. On “Water for Elephants” we had one field north of Los Angeles where we did all the different cities the circus plays in. We had the tents custom-made, and found all the accompanying wagons, animals, etc. Then we switched the configuration of the tents around for each city, and VFX added the different digital backgrounds for each location. Most of “Lincoln” was shot on full sets and locations. They did augments scenes like the Inauguration, where the front part was the Virginia Capitol Building steps and portico, and VFX added all the rest of the building behind it, with its dome and wings. The City Point scenes were shot on a set with scenic boats and buildings, built in a field not near water. The shots were framed in such a way that did not require the “river” to be digitally added. Kirill: You did three movies with Terrence Malick (“The New World”, “Tree of Life”, “To the Wonder”). Does it get easier as you get to know your collaborators over multiple productions? David: It does. It becomes easier, because you become friends with them, and you get to know how they work and what they like and dislike. The barrier of being new is gone. Over the three movies that I did with Terrence, his style became more and more abstract, and his last one, “Knight of Cups”, which I didn’t do, is even more abstract. “The New World” had a script, “The Tree of Life” had a really long script/ outline, and “To the Wonder” had no script [laughs]. But at that point you know him, and you start to know what he will ask for. So in that sense it does become easier. White House portico / entrance on “Lincoln”. Courtesy of David Crank. “River Queen” boat being built and painted for “Lincoln”. Courtesy of David Crank. Kirill: How do you describe what you do when you are an art director on a production? David: In a nutshell, you have a production designer at the top, which is what I’m doing now. Then you have on the next level down, you have an art director and a set decorator. The art director deals with scheduling, construction budget, and the construction and painting of the sets and locations. The set decorator is responsible for procuring all of the dressing, furniture, draperies, etc. When you have a situation that works well, those three people are together all the time. Each one has their specific job, but you work closely so that everybody knows what the whole picture is. It’s really bad when it gets too separate, because one hand starts doing things that it didn’t know the other hand was doing [laughs]. Kirill: As far as the budget goes, would you say that the art director is more hands on with it, or is it everybody’s job to keep track? David: The art director is hands-on with the construction coordinator for the construction budget. What is called the art department is technically the production designer, the art director, the assistant art directors, the draughtsman and the graphic designers. The construction department is separate, and besides carpenters, includes the painters, the plasters, and the greens crew. The set decoration department is also separate, and the decorator and his/her staff track their own budget. We sit down at the beginning and figure out our plan together. I work on the design with each one of them as they develop their budgets. As we proceed in prepping and filming, if they think things are headed over the budget in a certain area, they come to me,. and we reconfigure our plan to better fit the reality of the budget. 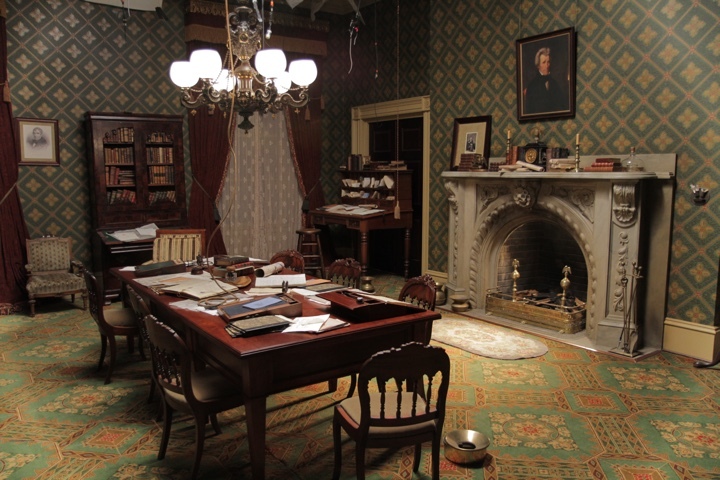 Studio set for Lincoln office on “Lincoln”. Courtesy of David Crank. Kirill: As a production designer, does it help that you’ve worked as an art director on multiple productions? David: Yes, I think it does. It certainly makes you aware of what is involved in getting something built. Hopefully the design process is a little streamlined because of that knowledge. It is like going to the auto repair shop with some basic understanding of how a car operates. You can talk a little more intelligently about the task at hand. Kirill: Moving to “The Double”, how did it start for you? David: I was in the middle of working on “Lincoln” when they contacted my agent. I didn’t know the director or anybody involved with it. I first had a Skype interview with Richard Ayoade, the director, and then phone interview with the two producers. Then they offered me the job, sent me an airplane ticket, and off I went to London [laughs]. It kind of fell out of the sky. Richard is a big fan of Paul Thomas Anderson, and I think that was part of the reason for the connection. It was a bit like stepping off into the unknown because I didn’t know anybody, and since it was in London, I wasn’t able to take any of my usual crew. I found new crew in London though, and fortunately I hired all incredibly talented people. I felt I’d won the lottery. It was a really pleasant experience. Kirill: Was it clear from the beginning that this was going to be a story with very unusual visuals? David: Yes, it was a very quirky story that you couldn’t quite imagine being set in a normal environment. I could tell from my first interview that Richard has a mind that runs continuously, in a very interesting way. He’s quite reserved, but he always comes out with an observation slightly to the side, that sent things in an exciting direction. The first script I read though, was very different tonally from what we eventually shot. In that version, the office was quite huge and bright, and always full of people. Over the course of scouting for 3 1/2 weeks, we looked at so many types of places, and were influenced by what we found. The look gradually developed into the dark, fairly empty world we built. In the end, we chose a single location, about 45 minutes west of London, that would allow us to do all the sets in one place. There were about 6 buildings and grounds that we used. Kirill: And those building were unoccupied? David: They were! It was an old a car testing facility. There were buildings that had warehouses in them, there were office buildings, there was a cafeteria building – all different styles on this one property. We enhanced everything with construction and painting and used places over and over again. In a way it was a cross between doing a movie and summer stock. Left – cubicles set being built. Right – the finished set. Courtesy of David Crank. Left – idea sketch of a cubicle. Right – cubicles being filmed. Courtesy of David Crank. Kirill: So all of the major sets – the office space, the apartments, the diner – were built inside these buildings. David: Yes. The office set was centered in a long, high-ceiling garage, with a series of other rooms spread over two floors which we cobbled together to make the company work spaces. The office of the manager had been a concrete curing test room, with a wire mess floor looking into the room below. Next to the main office space, was a large warehouse where we built the train station, where Simon arrived each morning for work. Every space ended up being the background of the space connected to it. The diner was built in a room that was once used as an employee canteen. There was nothing left in it but the stainless steel cooking vent at one end. The break room with the giant coffee machine was a mechanical room that had that giant exhaust hood under which we placed the oversized, under- performing coffee machine. The apartments were part of the original office block. Their arrangement actually was much closer to what we originally envisioned than what we found from scouting actual East London apartment buildings. They had a very impersonal, bee-hive quality that we liked. We outfitted spaces in the old offices on two sides of a courtyard with the apartment sets. They were shot out of sequence with parts of each apartment shot in multiples spots to afford the views we needed. It became quite a scheduling challenge. Kirill: What about scenes shot outside, as the two characters walk and talk between the buildings? David: Some of those was outside, in the courtyard that the apartments overlooked. Connecting corridors were done in an old concrete rifle practice range located underneath the construction shop. There was a paved car track running through the woods which we also used, and the cemetery was shot outside the company cafeteria, which oddly enough looked like a crematorium from the back. 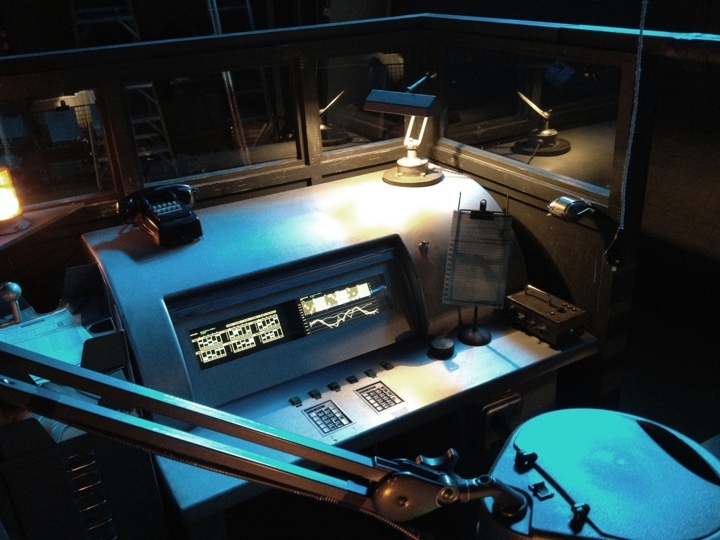 A still of the cubicle set from the final cut. Kirill: There’s a lot of unusual colors and textures in all the sets. How much of that existed in the sets, and how much was done in post-production with color grading? David: I am sure a certain amount was done in the timing, but we created most of it in the actual sets. The color palette was very carefully developed, and we painted most every space we used. It certainly helped that the buildings were old and layered- much of the texture was there- but where it wasn’t, we added it. We also brought a lot of ideas from other places we’d scouted- I based the workers’ cubicles on these odd warehouse offices we found in the old Post Office Sorting Station in London. They had abnormally short doors which we adapted and made so that the only person who could walk through without bending over was the boss, played by Wallace Shawn. Kirill: You mentioned that it was a lower budget production. Does that create some kind of a framework that constrains you and you have to be creative to deliver that vision that you’re working on? David: I think it does. I find that it is always useful to have a barrier. If you don’t have any barrier, you keep spreading out, and it becomes unfocused. It can frustrating for sure, because there’s always one more thing that you want to do, and you don’t have the money for it. At the same time, if you know from the beginning that that’s going to be the budget that you’re working with, you’ll find a way to make what needs to be there, happen. And if this bothers you, you should probably be doing some other work [laughs]. Constraint is what I think can actually help your work. Kirill: Is there ever such a thing as enough money? David: There’s never enough money. As soon as you have more, people want twenty times more things. You could get 10% more budget, and they’re going to ask for 50% more things [laughs]. But somehow there is enough to do it, and you come up with the way to do it. One of the great things about working with Richard, who also wrote the script, is he is really hands on, and he reacts well to what is in front of him. When we were first talking about the buildings and the courtyard, we wanted to build a fourth wall so that the courtyard was completely enclosed. Unfortunately, there wasn’t money to do it, but Richard was never precious about anything. So when I said “I hate to be the voice of no-no-no, but I don’t have the money to do this. Can we do this instead?” he replied, “Right. Let’s go outside and look at it.” Within 10 minutes he’d reconfigured things to work with the new idea. He always agreed to look at things and work within our budget. And nothing really suffered. Another example of inventiveness concerns the subway car. It was originally in one tiny scene. We knew that we would have to build it, and were afraid it would be quite small due to our budget. My art director, Denis Schnegg, found an old American school bus that was brought over to England for “Batman” which we bought and converted into the train car. It worked so well, that suddenly there were many more scenes on the train. Richard gave it a bigger role! Left – the original school bus. Right – interior altered to look like a subway car. Courtesy of David Crank. A still of the subway car set from the final cut. Kirill: What was the set-up to emulate the motion of that subway car? David: We put the forks of a forklift under the front of the bus, and shook it. And I think at first we tried to shake it by using some boards like levers in the axle area, but we ended up using the forklift because the bus was so heavy. For the effect of moving lights outside the train, it was a combination of some spinning lights on stands, as well as lights on small rolling platforms which tracked back and forth down the outside of the bus. A crew member ran these up and down the track the whole time we were filming inside the bus. It was a very poor man’s process [laughs]. Kirill: It looked very believable. David: It did work very well. 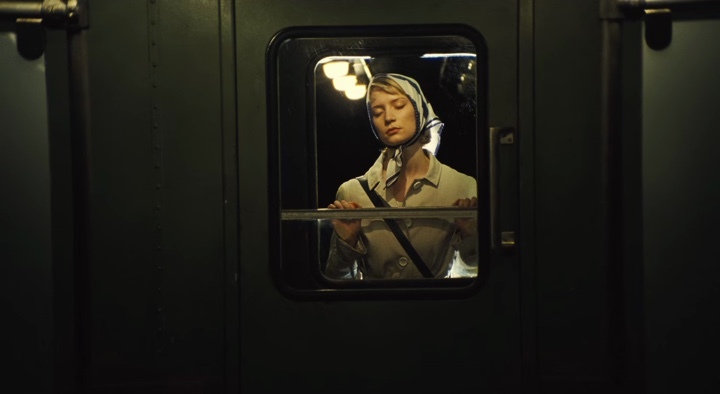 We only had the one train car interior, and as we prepared, Richard decided he wanted to also see the character of Hannah in the car ahead of Simon. With a little help of an additional 6′ deep set extension that we added to the rear of the bus, we were able to shoot through that into our car, and when edited together, made our one car appear as two. Kirill: Does it help to have access to the monitors where you can immediately see what the camera sees, without having to wait for the dailies? David: I can’t quite imagine being able to film without that video playback. We still see dailies a day or so later, but the advantage of seeing your efforts immediately is amazingly helpful. It seems to me that you’d get a much more measured and formal way of shooting if you had to wait until the next day to see that you got it. You might not try as many crazy things as we do now. The camera is lighter, and you can shoot and immediately know whether it worked or not. Paul Thomas Anderson does prefer to work on film, as he is crazy about the quality film has.”Inherent Vice” was shot on film, and we did go every night to watch the film dailies projected. He does use a video monitor while filming though, so he sees what he’s getting at the moment. “The Double” was also shot on film, but each morning I would get the previous day’s work transferred to a digital form a thumbdrive to watch on my computer. Kirill: Is film here to stay? David: I would hope it stays. I don’t know what the statistics are. The problem, from what I understand, is with the processing as there aren’t that many places that develop film anymore. I am sure there is a cost issue as well. I think there will always be people who will use it because they like it.”Tree of Life” was a combination of film and digital, as far as I remember, but most new things projects I work on are all shot digitally. Diner set being built. Courtesy of David Crank. A still of the diner set from the final cut. Kirill: Does it matter for you as a production designer if you work with film or digital? David: I can’t say that it makes a huge difference. It you still watch the preliminary tests to see how the color is reading and how details in the scenic painting are captured, but personally I still try have everything ready to the same state of finish, whether it be film or digital. It seems that as I’ve come along, that we tend to do fewer partial sets now- but I’m not sure if that is just particular to my experience or not. It may just be a difference in the way that directors like to work. The people I have been with tend to like a certain amount of improvisation, and that just demands more complete sets so that you don’t come up short. Kirill: Is there anything else that has changed for you over the years with digital technologies? David: The progress of CGI is amazing. When I began, we would always build as much as we could, and the CGI team would add or extend the set along the edges. It was really two distinct parts. We did our work, and then separately and afterwards, they would do theirs. But now, the process begins almost on day one. I sit with VFX team and talk about the overall look, and how their work can influence mine. It’s a much more satisfying journey, which keeps the design team involved through to the final look. I’m just starting a new project now, and we’re trying to set the structure up in the same way. The scale of the set will require that much of it be done digitally. You want to make sure that you figure out what the entire world looks like and that the VFX experts help you find the best way to make the two parts- the real and the digitally created- combine seamlessly. That’s what you’re always trying to achieve. Left – original model for computers. Right – mockup of a computer. Courtesy of David Crank. The finished computer on the set. Courtesy of David Crank. Kirill: Going back to money and budgets, it feels like the world of feature film has tentpole sci-fi on one end and low-budget indies on the other, and a cluster of drama around the Oscars. There’s not much space left for mid-budget drama in the theaters. David: It does seem that way. It all depends on where they think they can make money. The producers that make movies have the bottom line of whether they’re going to make their money back. There aren’t many that are in it to just make a lovely piece of art. Terrence’s movies are kind of that way, but they aren’t big-budget either. As I’ve come along in the business, I do know that crew people are generally paid better, and get more benefits than when I started out. My first deals always read “for a 5 or 6-day week.” All of these benefits for people cost money, and that makes the business more expensive to run. So, it is only to be expected that the bottom line is an economic one. Nobody is going to put $60M into something if they think they’re only going to make $10M back. That’s a bad business practice [laughs]. Kirill: Some of that might be done to keep up the prestige of the studio, to show the list of their Oscar-nominated films. David: True, but I doubt they would ever want to put in $100M just for the prestige. Maybe $25M. Even that is push… So a bigger-budget production will most likely be more generic, in hopes of reaching as many people as possible, and generating as much income as possible. I tend to do smaller ones, because usually the story is quite interesting. That’s often what the difference is- the focus on the story. And the story is what is going to last. 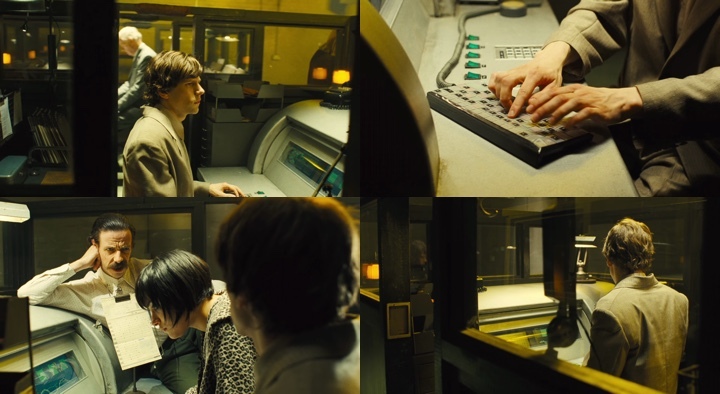 Stills of the computer from the final cut. Kirill: There are so many layers that are placed on top of your work, from how camera sees it, to the editing and color grading and visual effects. How hard is it to make a movie where everything clicks together? David: It’s always slightly luck of the draw in how they turn out! You have 6-10 weeks to shoot a film, and then you step away while somebody else puts it together. It all goes so fast. Nobody is working under optimal conditions. Sometimes it feels like you really don’t have a chance to think about what you are doing. I have one shot to get it right, because once they’ve shot it, they are not going to want to come back. If you do a play, and one day the cushion is not there on a chair, no one is going to notice. But if you shoot that on film, that missing thing never shows up. It requires that everyone working together be in sympathy with each other in regards to the outcome. That requires a lot of communication, and fast thinking. You want to get as much of it correct upfront. It’s a whirlwind, and it’s always amazing to me that any of them turn out well. Kirill: You work on a production for those long weeks, and you get to see every detail of every set, and you know the script back to back. As you watch it in the theater for the first time, do you look at the particular details of your work? David: You do that to a certain extent. When I started in film, I was a scenic painter before I became an art director. At that younger stage, I really did just watch the scenery, because I’d never seen any of it on film beforehand. It’s part of my job now to watch dailies every day, so I have gotten to see what it looks like on film before it is in its final form. Hopefully it’s not a shock when I see it in the theater! To me the only time I stop and really look at the scenery now is when the story is not working. If the story is interesting, I pay no attention to the scenery. It’s doing what it is supposed to do- helping to set the tone and the mood, but not overpowering the story. Kirill: What makes you stay in the industry after all these long years? David: If I analyze that too much, I might find that I’m weird [laughs]. Seriously, I can’t think of anything that I’d like better to do. One time when I was young, I went through a period when I didn’t have a lot of employment and I thought I should explore other options of work. I made a list of everything I thought I could do, and then I made a list of everything that I had done. Next I crossed out everything on the two lists, I didn’t really want to do or do again, and all that was left was film work. So I decided that must really be what I should be doing. [laughs]. I like to design scenery and to make things that tell a story. That’s what ultimately I keep on going back to. I get up in the morning and I get to go make something. And that’s very exciting to me. Even on my days off I still make stuff, because it’s this weird crazy thing that I have in me. Certainly the long hours and the hard work are a part that aren’t always fun. Being away on the road is not always such a charmer either. You’re not at home, you’re not settled, you don’t have your family and friends. But on the other hand, I don’t mind focusing intensely on a project for 6 months- it’s a way I like to work. And afterwards, I can take 3-4 months off. It’s not a bad trade. Every day you ask yourself, “So what are we doing today?” If you don’t have that kind of an attitude, it would probably be a horrible job [laughs]. All of those other things you’re missing would take precedence. But if you look at it that somebody is paying you to do this, it’s an incredible job. Kirill: And you get to tell these great stories. It’s like a birthday party every day or something. It’s crazy. All the bad stuff seems insignificant to the parts that are fun. When people ask me what they should do, I tell them that they should do whatever, but that they should enjoy it. That’s the only part you’re going to remember anyway. So find something that is fun. Kirill: It’s great when people can find something that they can enjoy doing for a living. David: Exactly, because it’s a lot of hours in the day. I was once offered two jobs- one ready to go, the other still not set to start. Unfortunately the second one was the intriguing one to me. I told my dad that everyone was encouraging me to do the first film for what they thought were obvious reasons. But I realized that I would be the one who had to get up every day at 5:30 in the morning to go do work I didn’t find interesting. My father looked at me and said “There is no reason at this point in your life that you need to do anything that isn’t fun.” Well, there you go!. If your father tells you to go have fun, you go have fun. I think it may have surprised him that he gave me that advice [laughs], but I’ve run with it ever since. 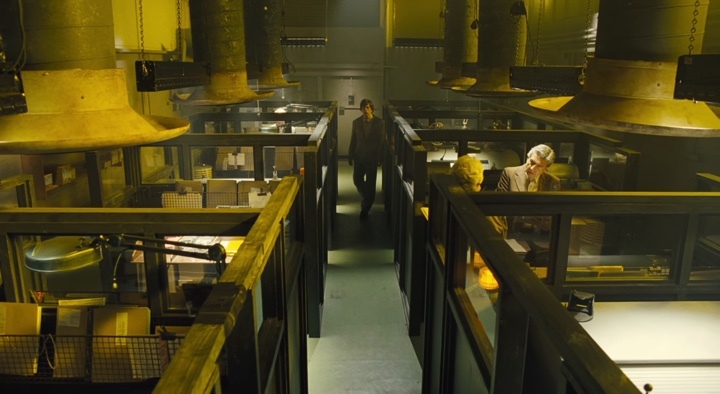 And here I’d like to thank David Crank for graciously agreeing to answer a few questions I had on the art and craft of production design, and on what went into creating the wonderful world of “The Double”. Background materials for the interview were provided by David. If you want to know more about how films and TV shows are made, click here for additional in-depth interviews in this series.